You probably also can remember that you germinated seeds with the ‘paper towel method’. And even to this day, the paper towel germination method, is an effective way to germinate your marijuana seeds. But is it the most effective way? And today's post you're going to learn the most effective way to germinate your weed seeds. Keep bright light on the emerging seedling. It's not the best method to germinate your seeds. With the paper towel method you do disturb the seedling (violation of rule number 2) by transplanting it from the paper towel to your soil / rapid rooter plug. I have tried to paper towel method myself quite a lot of times and it does work well most of the time. But giving your seedling a better treatment will result in a better start, which in turn will snowball into a stronger plant and a stronger plant means higher and qualitatively better yields. There is a small possibility, that your marijuana seeds came with bacteria and/or fungus on them. But what it can do is stunt the growth of your plant, in its initial growth stage. To prevent this from happening, I highly recommend soaking your seeds in a weak bleach solution for 20-30 minutes. 1 tablespoon of bleach in 1 gallon / 3.8 liters of water. Pre-soaking your seeds for at least 12 hours, before planting them is an extremely effective way to ensure a greater germination percentage and much faster germination rates. How much faster exactly is also dependent on the seed, but generally it will cut down germination by a few days. I recommend you sterilize your starting soil by putting it in the oven at 200 F. (93 C.) for 20 minutes. This way you'll kill off any harmful bacteria and/or fungi present in your soil. Again, you'll probably be fine if you don't do this…but it's just another measure you can take to maximize your chance to succeed and yields. After you've put them in the oven for 20 minutes, you let the soil cool off. Then you get 20 oz (0,6 liter) foam cups and punch holes in the bottom to help with drainage. Lastly, you fill up the cup with the sterilized soil. 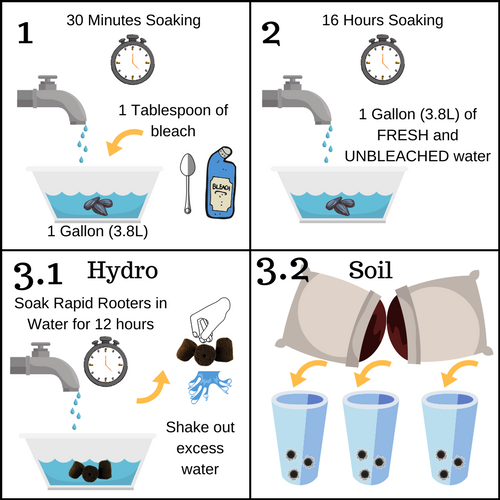 With hydro it is essential that you prepare your rapid rooters / riot plugs by soaking them in water for 12 hours. After 12 hours shake out excess water. Don't ever plant your seeds in your rapid rooters / riot plugs without doing this, because you will set yourself up for failure 100%. Plant the seeds ¼ inches (0.6 cm) deep in your soil (when growing in soil germinate your seeds in 20 oz / 0,6 liter foam cups and punch holes in the bottom to help with drainage). Then water your cups until water runs freely through the drainage holes. You need to create a moist enough environment for your seeds to sprout and grow, and by doing this you ensure your the inside of your soil is moist enough for at least a few days. In the next few days or even week, all you need to do spray the surface with some water. Simple: just plant the seeds in your rapid rooter or root riot plugs. Moist the surface of your growing medium lightly by spraying it lightly. The surface of your growing medium will dry the fastest…so by spraying it lightly you'll make sure even the surface will stay moist for at least 1-2 days. 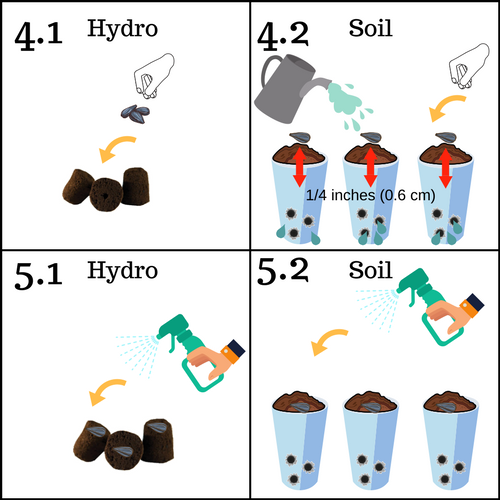 After 1-2 days all you do is spray the surface of your soil/rapid rooter…that's all your plants need in this stage if you didn't skip step 4 (so don't water your seeds in the next few days, only spray them).